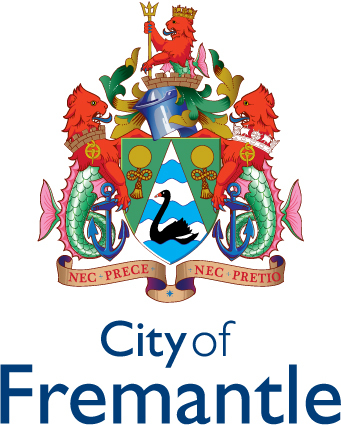 The City of Fremantle Coat of Arms is the armorial bearings of the City of Fremantle – granted by letters patent 20 April 1971. The pile (or wedge shaped area) coloured silver with wavy blue lines alludes to the position of Fremantle at the mouth of a river. The black swan identifies the river as the Swan River, and at the same time symbolises Fremantle’s connection with Western Australia. The pile divides the remainder of the shield into two triangle areas, coloured green, which represent an open cape, or mantle. The tasselled cords are not joined, and the result is an heraldic pun, viz. A free mantle. Such arms are known in heraldry as canting’ (or punning) arms. The crest is reminiscent of the crest of the Fremantle family, except that the lion has become a sea lion and has exchanged his flag for a trident, thus echoing the emblem Fremantle has used for many years. The sea lions supporting anchors symbolise Fremantle’s connection with England and its maritime and naval interests. The sinister sea lion (i.e. the right hand one) has a naval crown around its neck. Naval crowns are used in the arms of distinguished sailors and naval towns of consequence. The gold buckles occur in the arms of the Stirling family and so commemorate Sir James Stirling, the first governor of Western Australia. Two red lions occur in the arms of a family by the name of Samson; thus a happy allusion is obtained to the Fremantle family of Samson. The motto, which is also that of the Fremantle family, is taken from an ancient Roman work of rhetoric. The original reads Nec prece nec pretio…a recta via deduci; Neither by entreaty nor by bribery…to be drawn from the right path. The arms were designed by Conrad Swan, Esquire, Ph.D., M.A., York Herald of Arms. The City of Fremantle Coat of Arms is a © copyright item.